Object recognition is a widely studied problem in computer vision. Template matching with correlation filters is one of the most accurate strategies for target recognition. However, it is computationally expensive, particularly when there is no restriction in the pose of the object of interest and an exhaustive search is implemented. 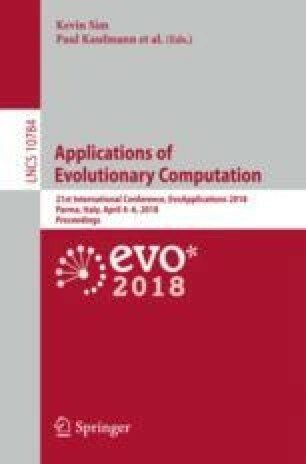 This work proposes the use of a Covariance Matrix Adaptation Evolution Strategy (CMA-ES) for post-processing template matched filters. The proposed strategy searches for the best template matching guided by the discrimination capability of a correlation-based filter, considering a vast set of filters. CMA-ES is used to find the best match and determine the correct pose or orientation parameters of a target object. The proposed method demonstrates that CMA-ES is effective for multidimensional problems in a huge search space, which makes it a suitable candidate for target recognition in unconstrained applications. Experimental results show high efficiency in terms of the number of function evaluations and locating the correct pose parameters based on the DC measure. This work was funded by CONACYT (Mexico) project FC-2015-2/944 Aprendizaje Evolutivo a Gran Escala. First author was supported by CONACYT scholarship No. 605992.